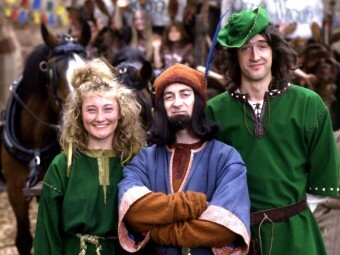 Tony wrote and appeared in Maid Marian and Her Merry Men. He played the Sheriff of Nottingham. 26 episodes were made and aired between 1989 and 1994. As well as the programmes, several comic books were written and two videos released. Click on image to see a bigger picture. How the band got together The Miracle of St. Charlene. David Chilton & Nick Russell-Pavier wrote the music with Tony for Maid Marian & Her Merry Men.